Club Asena a tourist place which is situated at the west of Kyrenia, exactly 10 kms west of Girne in the town of Lapta has stunning beauty and nature because of its surrounding mountains and seas. This club has a very green surroundings and it is situated at a distance of just 48 kms from the Ercan Airport. 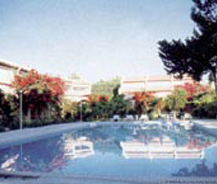 This club is situated in North Cyprus which is famous for tourism which has many clubs and resorts from its olden days. This club is mainly a family based one and it has nearly 20 bungalows with a swimming pool and a restaurant at its other end with two bars. The bungalows they provide are double Decker with upper floor comprises of only bed room with double glassed windows which provides sound proof environment and the ground floor with sitting rooms, kitchen which is fully equipped. Other than that it also engulfs air conditioner, TV, refrigerator, and telephone lines. Room service is available for 24 hours so that the guests can order anything at anytime. This club has a very calm atmosphere and it is very safe, as the restaurant and swimming pools are allowed to use only by the guests of the club.